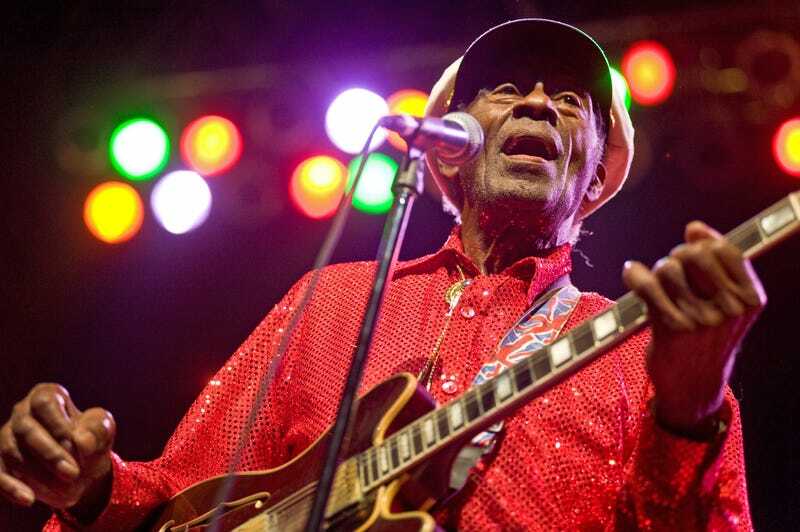 Charles Edward Anderson Berry Sr.—better known as guitar god “Chuck” Berry—has passed away at the age of 90. Berry’s death was confirmed by the St. Charles County Police Department, which wrote on its Facebook page that the legendary musician was found unresponsive in his home just before 1 p.m., and pronounced dead shortly thereafter. Berry, known for what Variety calls “droll singing, inventive guitar licks and acute eye and ear for the nuances of teenage life,” received a lifetime achievement Grammy in 1984 and was one of the first inductees into the Rock and Roll Hall of Fame in 1986. Berry also had some difficulties with the law, and in 1961 he was convicted of violating the federal Mann Act prohibiting the transportation of a minor across state lines for “immoral purposes.” He received a three-year jail sentence for employing an underage Texas prostitute in his St. Louis club. Eschewing the studio for the last three decades of his life, Berry scratched his musical itch by playing dates at his hometown club BlueBerry Hill and paid the bills with gigs at rock and blues festivals at home and abroad. The star was hard to handle, and the shows were carelessly played more often than not, but his legend saw him through professionally until the end of his life. Berry collapsed on stage in the middle of a New Year’s Day 2011 concert at Chicago’s Congress Theater. Berry’s exact cause of death is unknown, though his son, Charles Jr., told Rolling Stone that he had recently suffered a bout pneumonia.